The cycle we aim to fulfill is to distribute meals, collect plastic, educate the locals & then reuse the plastic to build houses. The locals and non-locals queue in line. Locals pay with 10 plastic bottles to receive one meal with a drink. Non-locals pay with minimum 5 bottles and minimum 5 USD, which will be reinvested into the organization of the next event. Once the bottles are delivered, people get a voucher for their meal. 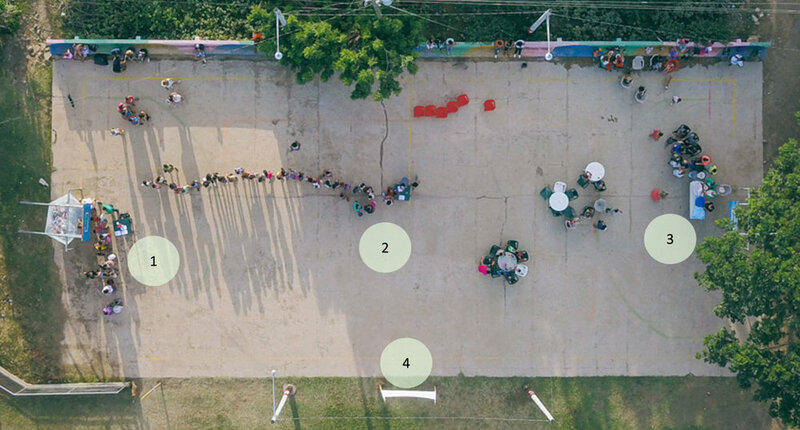 All participants have to stand in line for registration, so that we can get an overview of who they are, where they come from and which age they have. Furthermore, they can sign up for the upcoming event, so that we have an estimation of the amount of supplies needed for the next event. Here, people exchange their voucher for a warm meal and a drink. They have to bring their own plates and cutlery, since we don't want to create more waste! After the people have finished their meal and the sun starts to set, we start the cinema. One of our main priorities is to raise awareness regarding plastic pollution and therefore, we show movies that tackle this subject alongside other amusing entertainment.